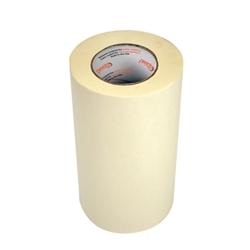 This is a premier, latex saturate application tape with a natural rubber high tack adhesive used for the clean pick-up and transfer of lettering and graphics. The product sticks and lays flat to the exposed release liner and cut vinyl graphics to protect against wrinkling, tunneling and edge curling. 7186P-LFA is recommended for use on computer cut graphics and die-cut lettering and is especially good for use with small and medium size plotters.